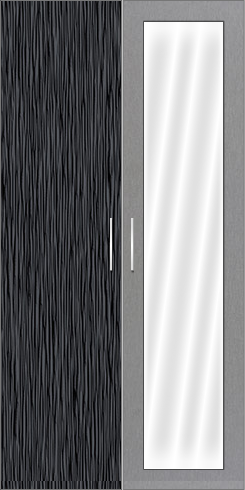 This is a basic two door door wardrobe with a lot of internal drawers. The design not only increases the utility but also offers the latest looks in the market. The left door with the pattern has been accentuated by the plain right door with the same hue. A full mirror given on the right door, and this can be customized at a very affordable price to have a mirror of half size if necessary. Interior: The interior has 4 internal drawers that are half in size. Remaining space is filled with a lot of removable half shelves where books, clothes and other accessories can be stored. The design is done in such a way that the space can be used for dressing and makeup storage.